The East Fork of upper Kaibito Creek is a small tributary containing a short but very beautiful stretch of narrows, quite different in character to the main canyon, as the channel is largely a series of circular potholes joined together, with many smooth curves, sharp S-bends, vertical fins of rock and small arches; all very colorful and striated. The canyon deepens quickly near the junction with Kaibito Creek, passing over several sheer drops including one of over 50 feet at the end so it is certainly not possible to reach the main canyon without rock climbing skills and a long rope. Still, a round trip through the accessible part of the East Fork canyon takes only about an hour and is an excellent short hike. The narrows are reached by a continuation of the Navajo Reservation track that branches north off highway AZ 98 - see the description for Upper Kaibito Creek. After about 6.5 miles from the main road, and just over one mile from the suggested parking area (at a water trough) for the main drainage, the track crosses the East Fork streambed over a small bridge. At this point the creek is a shallow sandy wash, dry for most of the year. 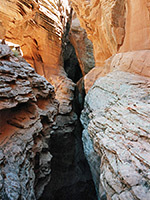 The slot canyon begins about 1.5 miles downstream (westwards). Closer vehicular access is possible from a side-track that forks left, half way between water trough and bridge. It too eventually crosses the East Fork creek, much closer to the start of the narrows, but the track is sandy and rather uneven. 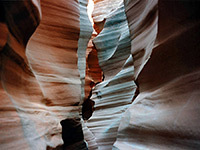 As for Upper Kaibito Creek; the Navajo have not allowed any access to the canyon since 1998. 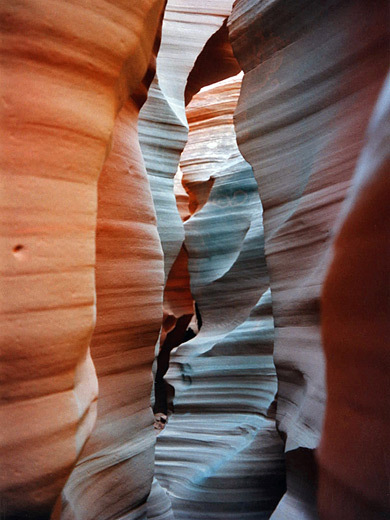 The creek is still sandy and mostly shallow for a few hundred yards west of the closest approach road; then it begins to deepen, and becomes rocky, enclosed by colorful cliffs of Navajo sandstone. The streambed has several rounded potholes with drops of 4 feet or so, just high enough to make progress a little difficult, particularly when coming back. The canyon eventually becomes 50 feet deep and especially pretty, and the swirling effects of flood waters are evident from the many wonderful forms of the rock walls; protruding fins and ridges, sharp bends and delicate curves, like the folds of a curtain. There are also several arches and mini caves in the rock, where the water splits and flows along different courses. Easy progress along the canyon is halted after only 15 minutes by a smooth round pothole with a vertical drop of about 10 feet. 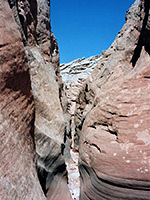 There is no way of climbing down without using ropes, but East Fork does not extend much further anyway, as can be seen by walking along the slot at ground level. A short distance beyond this narrow section and drop-off, the canyon becomes temporarily straighter, wider and more open. Then there are several more sheer descents before the junction with Kaibito Creek, and a final drop of 50 feet or so; directly beneath is a deep, circular rock pool, still full of water even in midsummer. The end of East Fork is still narrow enough in some places to jump over, and the rim affords good views down to the ledges and channels far below.